Thank you, thank you, thank you for this handsome addition to my library. It's still parked by my bedside at the moment, but will be debuting in the kitchen very soon. The foreward is written by Alice Waters of Chez Panisse, but the book belongs to the owners of this San Franscico bakery institution, Elisabeth Prueitt and her husband Chad Robertson. 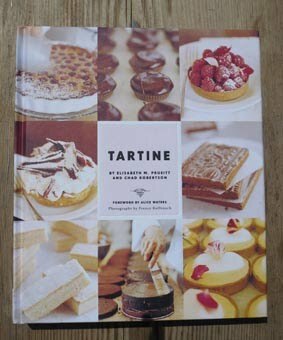 I haven't had the pleasure of visiting Tartine yet (it's only a matter of time), but have been told it always draws a long line from it's doors. You can tell by the name that it draws inspiration from European baking traditions. Inside are Bavarian cakes, a Toasted Almond and Lavender Parfait and Clafoutis, as well as a definitive Brownie recipe. I've been told they also do a mean breakfast in their cafe.